Last week, a "disturbing" document came out of Nashville that instantly caught the attention of every Christian. The Nashville Statement (read it here) was a document or creed signed by 150 evangelical pastors, one that labeled the practice of homosexuality as being at odds with historical Christianity. The response from some of my friends took me aback. Instead of ignoring it or supporting it, there was a vicious backlash. The signers of the statement were demonized as unloving bigots, insensitive old white guys, as enemies of all things Jesus stands for. Basically, people said they were Donald Trump. To be fair, I DID think the release of the statement was ill-timed from a PR standpoint. While the rest of the nation was focused on Harvey's destruction of the Texas coast, we suddenly had to talk about the Nashville Statement. I admit, I cringed. But the experience was eye-opening for me for reasons beyond PR-related. My dad often talked about the "heartless right" and the "headless left." Conservatives, so to speak, are hyper-rational but at times unloving. Liberals, in turn, can be super loving, but theologically confused. Some of you are going to criticize that as a gross overgeneralization or painting with too broad a brush. But last week, I saw a left that was rather heartless. For all the good points that left- or progressive-leaning Christians make, they most often lose me by wielding Christian love like a club, using it to beat down rational biblical thinking and the Lost alike. Yes, well-meaning Christians are using LOVE as a weapon to DESTROY both their brethren and those outside of Christ. Progressive Christian, you allowed homosexuality, a sin condemned in the strongest language in both Testaments, to create division between you and other Christ confessors. You ought to be ashamed. You ought to feel guilt. Furthermore, you threw shame on your Christian brethren for taking a stand on an issue THAT HASNT BEEN AN ISSUE IN THE CHURCH FOR 2,000 YEARS UNTIL THE LAST 50. Let's take a moment to appreciate the absurdity of that. In the same way, if I'm a Christian, the cat should be out of the bag on where I stand on homosexuality. It shouldn't shock anyone. And when I restate my position formally, if you try to make me feel ashamed for doing so, I'm going to thank you for proving my point for me. If you identify as being a Christian, that should come with a list of givens. You believe Jesus is the resurrected Son of God. You believe the Bible is inspired and inerrant. You enjoy potlucks. You love your neighbor. But you also condemn homosexuality, along with all other sins of the New Testament. This last point is arguably what most bothers me. Some of my friends got rather obnoxious with, "Where is the Nashville Statement on gambling. Or obesity. Or greed. Or pride." Evidently, there are sins that we need to focus on instead of homosexuality. But by that response, my friends validated the necessity of the Nashville Statement. By poo-pooing a formal declaration of what the church has believed for 2,000 years, the Left has exposed themselves to the fact that there is now great division and little unity on this issue. What will be next? The deity of Jesus? The inspiration of Scripture? Many of you know those ships have already sailed. Creeds and written statements historically have been crafted and issued to meet the challenge of the moment. Every Christian I know opposes obesity, pride, and greed. At least in theory. We aren't ignorant of what the Bible says about them. But I think homosexuality is now in a different category. Progressives are using love to destroy not only their brethren, but also the Lost. Those who practice homosexuality, even if they are our own family members or friends, need to know their destiny as sinners. They need to know the unequivocal doctrine of the church of Jesus Christ on this sin. And THEN, knowing our doctrine, they need to see our unconditional love. Making a statement on sin does not erode Christian love; it intensifies it. Love and truth go hand in hand; divorced from one another, they become cruel caricatures of themselves. When Jesus supped with prostitutes and tax collectors, they knew where he stood on their sins. I fear the same can't be said any longer for some of his followers on homosexuality. He told the woman caught in adultery to go and sin no more. Sacrificial love is not mutually exclusive of candid truth-telling. Finally, I want to ask progressive friends to stop this false narrative of Christians opposed to homosexuality "aren't living or loving like Jesus." Jesus-approved love does not delight in iniquity, but rejoices in the truth. You are creating a false dichotomy by saying that taking a stand on sin is unloving. But it is never unloving to reject iniquity and rejoice in biblical truth. Those of my friends who have come out of homosexual behavior would Amen that. To my friends on the left, some of you have already been acting headless. Now you're being heartless. You're better than that. And your Lord deserves better than that. I love you. I prayerfully hope we are still friends. 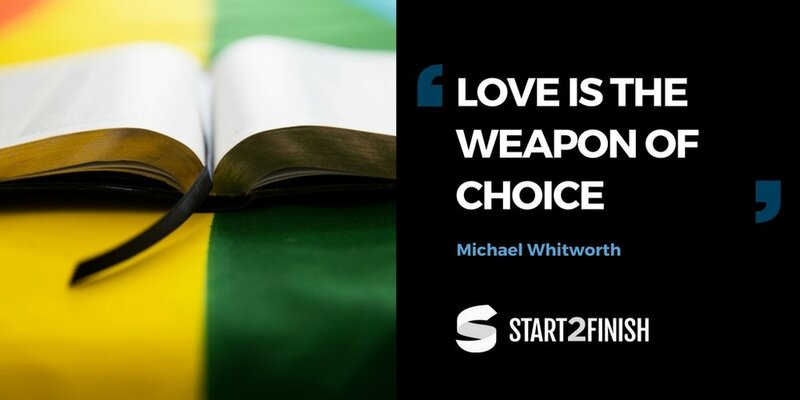 But stop using love as a weapon of choice.